İzmir Istanbul, Izmir, Piraeus, Alexandria. Ankara? Istanbul, Piraeus, Naples, Marseilles. Return voyages called also at Genoa. İstanbul? Istanbul, Izmir, Piraeus, Rhodes, Limassol, Beirut, Alexandria, Naples, Marseilles. 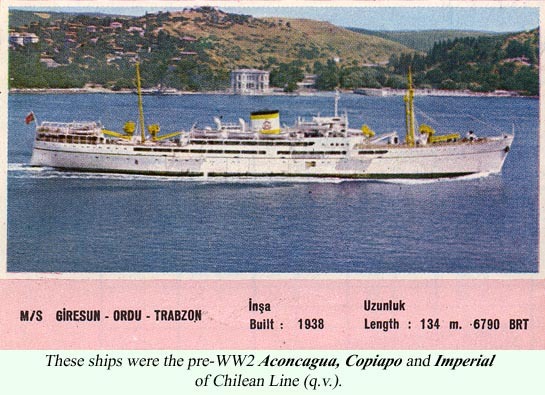 On the vessels, see another 1950 sailing list in the archives section. Ankara Istanbul, Piraeus, Naples, Marseilles. İskenderun Beirut, Alexandria, Malta, Naples, Marseilles. 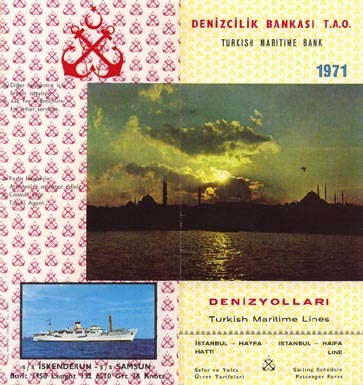 (most likely, but no ships mentioned in brochure; there is a photo of the Ankara above the sailing schedule for this route) Istanbul, Piraeus, Naples, Marseilles. 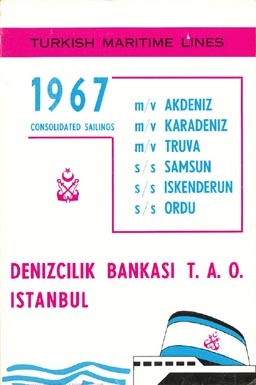 (most likely, but again no ships mentioned in brochure; there is an illustration of one of the sisters superimposed on the sailing schedule for this route) Istanbul, Izmir, Piraeus, Beirut, Alexandria, Naples, Marseilles. 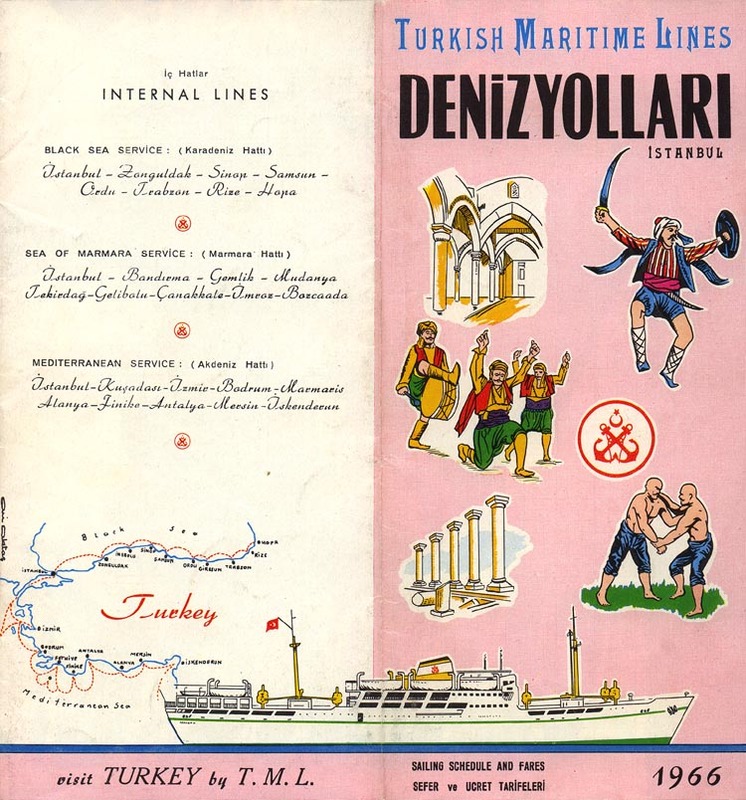 Return voyages called also at Genoa, omitting Izmir.
? Istanbul, Izmir, Antalya, Mersin, Iskenderun, Haifa. Return voyages: Haifa, Larnaca, Beirut, İskenderun, Mersin, Antalya, Finike, Izmir, Istanbul. Samsun Marseilles, Genoa, Naples, Alexandria, Beirut. Samsun Istanbul, Piraeus, Naples, Marseilles. Ankara Istanbul, Piraeus, Naples, Marseilles, Barcelona. 2) Istanbul, Zonguldak, İnebolu, Sinop, Samsun, Ordu, Giresun, Trabzon, Hopa. Return voyages: Hopa, Pazar, Rize, Trabzon, Giresun, Ordu, Fatsa, Ünye, Samsun, Sinop, İnebolu, Zonguldak, Istanbul. 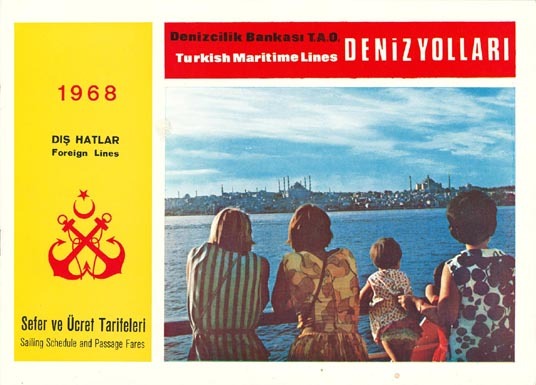 Karadeniz Istanbul, Piraeus, Naples, Marseilles, Barcelona, Marseilles, Genoa, Naples, Alexandria, Beirut. Return voyages: Beirut, Alexandria, Naples, Marseilles, Barcelona, Marseilles, Genoa, Naples, Piraeus, Istanbul. Istanbul, Piraeus, Naples, Marseilles, Genoa, Naples, Alexandria, Beirut. Return voyages: Beirut, Alexandria, Naples, Marseilles, Genoa, Naples, Piraeus, Istanbul. İstanbul Istanbul, Izmir, Larnaca, Haifa, Naples, Genoa, Marseilles, Barcelona. Trabzon (Jan-Feb + May-Dec) Istanbul, Sinop, Samsun, Ordu, Giresun, Trabzon, Rize, Hopa. Istanbul, Zonguldak, Sinop, Samsun, Ordu, Giresun, Trabzon, Rize, Hopa. 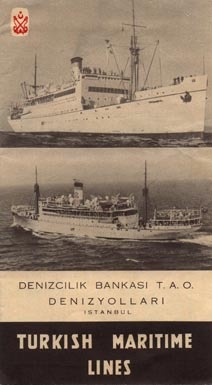 Return voyages omitted Rize and Zonguldak. İzmir (Jan-Feb) Istanbul, Zonguldak, İnebolu, Sinop, Samsun, Ordu, Giresun, Trabzon, Hopa. Return voyages: Hopa, Rize, Trabzon, Giresun, Ordu, Fatsa, Ünye, Samsun, Sinop, İnebolu, Zonguldak, Istanbul. Kadeş (May only) Istanbul, Akçakoca, Ereğli, Zonguldak, Amasra, Kurucaşile, Cide, İnebolu, İlişi, Abana, Çatalzeytin, Ayancık, Sinop, Gerze, Samsun, Ünye, Fatsa, Ordu, Giresun, Tirebolu, Görele, Trabzon, Rize, Hopa. 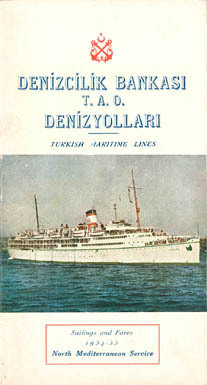 Return voyages: Hopa, Pazar, Rize, Trabzon, Vakfıkebir, Görele, Tirebolu, Giresun, Ordu, Fatsa, Ünye, Samsun, Gerze, Sinop, Ayancık, Türkeli, Çatalzeytin, Abana, İlişi, İnebolu, Cide, Kurucaşile, Amasra, Zonguldak, Ereğli, Akçakoca, Istanbul. Trabzon (Jan + Sep-Dec) Istanbul, Izmir, Marmaris, Antalya, İskenderun. Return voyages: İskenderun, Mersin, Anamur, Alanya, Antalaya, Finike, Kaş, Fethiye, Bodrum, Güllük, Kuşadasi (summer only), Izmir, Istanbul. Istanbul, Piraeus, Naples, Marseille, Barcelona, Marseille, Genoa, Naples, Haifa. 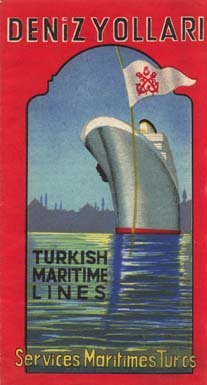 Return voyages: Haifa, Naples, Marseilles, Barcelona, Marseille, Genoa, Naples, Piraeus, Istanbul. Istanbul, Piraeus, Naples, Marseilles, Barcelona, Marseille, Genoa, Naples, Alexandria, Beirut. Return voyages: Beirut, Alexandria, Naples, Marseille, Barcelona, Marseille, Genoa, Naples, Piraeus, Istanbul. Return voyages: Beirut, Mersin, Naples, Marseille, Barcelona, Marseille, Genoa, Naples, Piraeus, Istanbul. Istanbul, Piraeus, Naples, Marseilles, Barcelona, Marseille, Genoa, Naples, Mersin, Beirut. Karadeniz Istanbul, Piraeus, Naples, Marseilles, Barcelona, Marseille, Genoa, Naples, Alexandria, Beirut. 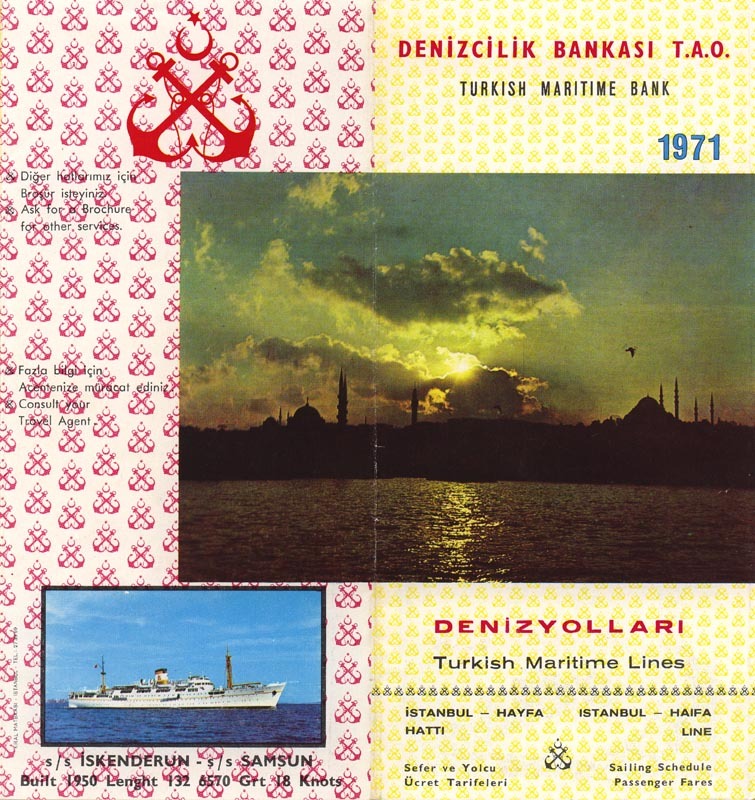 See the archives section for more brochures of Turkish Maritime Lines. This page last updated November 15, 2009.